Time will tell where Catt Sadler winds up after her exit from “E! News,” but she can be sure of one thing: She has Jennifer Lawrence on her side. “The Hunger Games” star Lawrence offered a show of support for Sadler, who said Tuesday that she had exited E! over a “massive disparity in pay” between Sadler and her male co-host. “Thank you Catt for sharing your story,” Lawrence wrote in a Facebook post that shared Sadler’s message detailing her reason for leaving E! Lawrence is well familiar with the concept of gender pay disparity in show business. In 2015, the actress wrote an essay titled “Why Do I Make Less Than My Male Co-Stars?” In it, Lawrence said that she learned that she had been paid less than her male “American Hustle” co-stars, and was disappointed with herself for not fighting for more money. Jennifer Lawrence has come a long way from her showbiz beginnings on TBS' "The Bill Engvall Show" in 2007. JLaw made one of her first red carpet appearances at the premiere of "The Burning Plain" at the 2008 Venice Film Festival. Lawrence won critical raves as Ree Dolly in the 2010 independent film "Winter's Bone," for which she earned her first Oscar nomination. Here's Lawrence at the 2011 Annual Palm Springs International Film Festival Awards Gala. And here she is arriving at the 2011 Golden Globe Awards for "Winter's Bone." Lawrence scored a nomination for "Winter's Bone" at the 2011 Screen Actors Guild Awards. Lawrence appeared at 2011 Academy Awards, getting her first Oscar nod for Best Actress in a Leading Role for "Winter's Bone." Here's Lawrence as Mystique in 2011's "X-Men: First Class." Jennifer Lawrence mesmerized in an undulating blue dress at the 2012 People's Choice Award, where she scored two nominations for "X-Men: First Class." She became a box office sensation playing bow-and-arrow wielding heroine Katniss Everdeen in 2012's "The Hunger Games." Lawrence was solid gold at the 2012 Los Angeles premiere of "The Hunger Games," one of the roles that catapulted her to worldwide stardom. Lawrence crossed the pond for the European premiere of "Hunger Games" in style. And she sparkled in emerald at a 2012 screening of "The Hunger Games" in New York City. JLaw greeted adoring admirers at a "Hunger Games" fan event in Madrid. Lawrence went with a two-tone look at the 2012 Academy Awards announcement, one year before winning her first Oscar for "Silver Linings Playbook." Here's Lawrence in her Oscar-winning role as the troubled Tiffany Maxwell opposite Bradley Cooper in "Silver Linings Playbook." Lawrence stepped out at the New York premiere of "Silver Linings Playbook." JLaw sizzled in a cutout dress at the 2013 Critics' Choice Movie Awards, where she snagged two Best Actress awards for "Silver Linings Playbook" and "Hunger Games." Lawrence posed with her Best Actress in a Comedy or Musical Award in the press room during the 2013 Golden Globes. Lawrence wore navy at the 2013 Screen Actors Guild Awards, where she picked up a trophy for "Silver Linings Playbook." Lawrence took a memorable fall when climbing the stage to accept her Oscar at the 2013 Academy Awards. She eventually made it to the stage to grab hold of her Best Actress award for "Silver Linings Playbook" at the 2013 Academy Awards. And then she changed into a metallic anthracite dress for the post-Oscars Vanity Fair party in 2013. Lawrence reprised her role as Katniss Everdeen in 2013's "Hunger Games: Catching Fire." JLaw went with all white at a "Hunger Games: Catching Fire" party at the 2013 Cannes Film Festival. Lawrence sizzled in a sheer dress at the 2013 Los Angeles premiere of "Hunger Games: Catching Fire," a role for which she would win an MTV Movie Award for Best Female Performance. Lawrence played Rosalyn Rosenfeld, the wife of a con artist, in 2013's "American Hustle." Lawrence lit up the press room at the 2014 Golden Globes after winning the award for Best Supporting Performance in a Motion Picture - Drama, Musical or Comedy for "American Hustle." Lawrence wore a patriotic sequined look when she snagged a trophy for Outstanding Performance by a Cast in a Motion Picture for "American Hustle" at the 2014 Screen Actors Guild Awards. Lawrence stood out in bright orange at the 2014 Academy Awards, where she was nominated for Best Actress in a Supporting Role for "American Hustle." Lawrence literally sparkled in a dress with a shattered-glass effect at the 2014 Vanity Fair Oscar Party. Lawrence took aim as Katniss Everdeen in 2014's "The Hunger Games: Mockingjay - Part 1." JLaw embodied the "China: Through The Looking Glass" theme at the 2015 Met Gala in New York. Lawrence took aim again in 2015's "The Hunger Games: Mockingjay - Part 2." Lawrence crossed the pond for the 2015 world premiere of "The Hunger Games: Mockingjay - Part 2" in Berlin. And continued to the "The Hunger Games: Mockingjay Part 2" London premiere. Lawrence went gothic at "The Hunger Games: Mockingjay- Part 2" New York premiere in 2015. JLaw starred as Miracle Mop magnate Joy Mangano in 2015's "Joy." Lawrence blended into a white background at the New York premiere of "Joy" in 2015. JLaw stood out in red at the 2016 Golden Globes, where she took home the trophy for Best Performance by an Actress in a Motion Picture - Musical or Comedy for "Joy." Lawrence arrived at the 2016 Academy Awards in February, where she was nominated for her title role in "Joy." In April 2016, Lawrence joined co-star Chris Pratt on stage at CinemaCon in Las Vegas to promote their upcoming romantic sci-fi movie "Passengers." 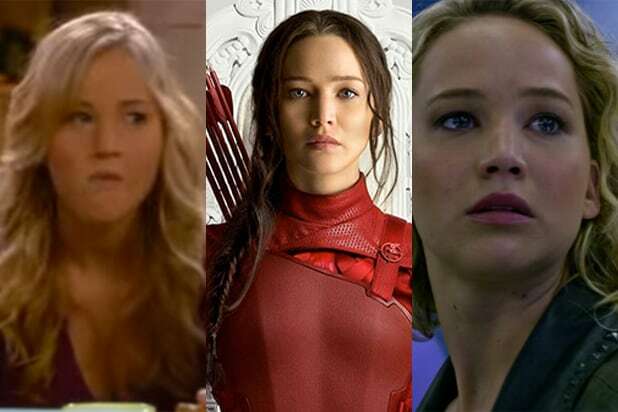 Here's JLaw reprising her role as Mystique in 2016's "X-Men Apocalypse." Lawrence sparkled in blinding silver at a May 2016 "X-Men Apocalypse" event in London. Lawrence seemed to be having a great time when she stopped by "The Tonight Show Starring Jimmy Fallon" in May 2016. Lawrence starred as stranded space traveler Aurora Snow in "Passengers." Lawrence and "Passengers" co-star Chris Pratt got together after an interstellar journey goes awry. JLaw played a stay-at-home housewife whose world is turned upside down by the arrival of a mysterious couple in "mother!," directed by then-boyfriend Darren Aronofsky. She played a secret agent seeking her own agency -- as in, self-determination -- in the 2018 spy thriller "Red Sparrow."